Prior to 1971, Cozumel was an island free of boa constrictors. The island did have a few other non-venomous snakes, such as the Green Vine Snake (Oxybelis fulgidus) and the False Fer-de-lance (Xenodon rabdocephalus), as well as “slightly” venomous snakes, like the rear-fanged Cat Eye snake (Leptodeira annulata). These snakes all fed on lizards, frogs, and toads, but the island was free of any arboreal snakes that preyed on birds. 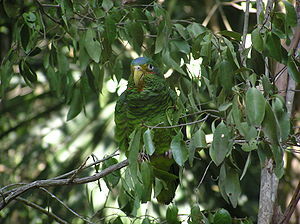 Consequently, the island was a haven for the Yucatan Amazon parrot (Amazona xantholora), also known as the Yellow-lored Amazon, Yucatan Parrot, or Yellow-lored Parrot. That all began to change in 1971. In 1971, Felipe Cazals made his 112 minute film, El jardín de tía Isabel, a movie telling the story of Spanish shipwreck survivors that was filmed at Estudios Churubusco Azteca (in Mexico City) and on location in Cozumel. Part of the filming in Cozumel took place near Xlapac on the northeast end of the island and more scenes were shot at Palancar Beach, on the southwest end. The film crew included an animal wrangler who brought a few collared peccaries, tarantulas, green iguanas, and a half-dozen boa constrictors to Cozumel to be used in the film as extra scenery. The boas actually appear in the film for a total of five seconds. These five seconds turned out to be disastrous for Cozumel, because once the filming was completed in April, 1971, the wrangler turned all the animals free near Palancar Beach. 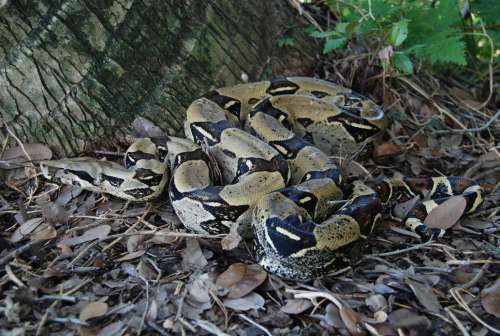 The boas found the island to be an ideal habitat and began to breed like wild-fire. One female is capable of having 60 live-born offspring every two years, and by 1991, these snakes started showing up all over the island. Growing up to six and a half feet long, the boas began to decimate the rodent and bird population of Cozumel. One of the snake’s favorite prey turned out to be the island’s parrots. In a few short years, the formerly raucous flocks of Yellow-lored parrots that were once one of Cozumel’s most visible (and audible) forms wildlife became a rare sight; the boas were wiping them out. Today, the parrots are hanging on, but in much, much lower numbers. The few that do remain are offspring of parrots that have survived through natural selection, as they are now nearly silent as they fly from tree to tree, most likely the result of the “squeaky-wheel” getting eaten!